Here's the good news: If your garden looks a little worse for wear, it's okay. Really. Mine does too. As much as I aim for- and largely achieve- a productive & beautifully manicured raised bed food garden year round, July and August are tough. If we have a "winter" or "barren" time in the garden, mid summer is it. The green beans have largely faltered; most tomatoes have succumbed to the late season blight (or simply stopped setting fruit once the nights got too warm); potatoes have grown, withered, and been dug up; cucumber vines - if not already dead- are yellowing fast; and the squash and zucchini have likely been overcome by the squash vine borers. On the upside, it's not your fault nor does it mean you're a lousy food gardener. It's just... that time of year. Here's a customer's garden. Still, technically, growing, but past its prime. Let's talk weeds.The #1 thing you always want to prevent with weeds is them "going to seed," which is gardener-speak for flowering, growing, drying, and scattering their seeds "all over creation." When that happens, one weed turns into 100 or 1000 or 10,000! So, when you see flowers on weeds, pull them up. If you don't have time for that, at least chop off the top so they don't flower and "set seed" this week. (But be warned, they'll be back trying next week). Also on the topic of weeds, the smaller you pull them, the easier it is. It takes less time to pull 10 baby weeds (or "cultivate," i.e., cut the roots with a weeding knife or butter knife just under the surface) than it does to pull 1 "big boy" weed. And, all baby weeds turn into big boy weeds, and all big boy weeds aim to sow their oats so... the earlier the better, which recommends that you to develop a near-daily 30-second garden-walk-by weeding habit. If you do this, you can avoid spending a full Saturday morning weeding once a month. Cleanup: just pull it (or chop it). All those leftover bean plants, lingering pest-ridden kale stalks, moldy cucumber vines... just pull them out. If you still have a cherry tomato or pepper or eggplant or, strangely, a squash vine that's still half healthy and producing, fine: prune off the dead branches, leave (or reposition - as needed) the portion remaining, but everything else: just chop it up fine to compost into the soil or, if there's any concern about, say, unsightliness or disease, pull it out; take it to your "back-40," compost it, whatever. Tip: I usually use pruners to cut off plants at the base, so I can leave the root balls in place. This is beneficial for the soil & makes the job easier and much less messy. Topdress: If you're harvesting & removing plant matter from your garden beds, you're indirectly removing nutrients from the soil. To maintain your garden's yield over time, you'll need to give back to your soil by topdressing with a couple inches of something like my Magic Mix or, alternatively, with a 4-5lb bag of an organic fertilizer per 50sq ft. More on soil fertility here. Replant: though it's not tomato season, there are a few veggies that will take the heat- thrive in fact: sweet potatoes, okra, basil and if you can track down baby starts: eggplant and peppers. You can also plant amaranth, aka calaloo because it is, for many purposes, a weed pure and simple, but it's also one of the only annual green leafy vegetables known to old timers that thrives in the scorching heat. If you have a source and you're willing to venture beyond the traditional lineup, you can also set out longevity and Okinawa spinach. So, once you clean up, go ahead and replant because the sooner you get things growing that you want, the fewer weeds you'll have to fight because they'll be shaded out. Let's talk timing. In an ideal world, we would have done our major spring-to-summer crop transition in June because then our okra & eggplant & sweet potatoes would have a full season to produce. But, to step back even further, to have transitioned in June, you'd have needed to start your spring tomatoes in March. But, alas, here we are in late July/August; it is what it is. Fall is just around the corner, so here's the trick: grow your late summer crops until mid September/October, then -- even if they're still growing & producing-- go ahead and transition to fall. (Note: you can always eat sweet potato leaves if your roots don't get a chance to develop in time.) If you don't replant then, you'll be late with the cool season, which will make you late with spring, which will put you back wrestling with cucumber vines next July, and nobody wants to do that twice. Unless, of course, you really like to glisten & feel like you're breathing through a hose. Anyway, the test of a food gardener is July and August, so if you can make it through and if you're not already a member, welcome to the real food gardener club. 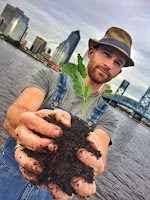 Speaking of which, I'm exploring the idea of a gardeners network to connect all us veggie gardeners, edible landscapers, and market gardeners for the sake of getting to know one another, encouragement, and mutual support. What do you think of the idea? please, click here to see my services & book me for a consultation, so I can assess your site; we'll discuss design, answer your questions, talk #s, and get your project lined up. I offer turn-key raised bed food garden support services. Also, with the fall season on the horizon if you'd like me to lead a Food Gardening 101 workshop in your neighborhood or for your community garden, shoot me an email. I thrive on collaboration and new ideas, so please send me an email. in freely sharing my stories & expertise, please consider passing along this article to a friend. Each of my articles take 5-10 hours of resource gathering, writing, and editing, so I want to make sure they don't just sit on the digital shelf. PS- Keep abreast of my workshops & speaking engagements here. Perfect! Just check your email to confirm your sign-up, so I can make sure I'm not sending updates to folks who don't want them.